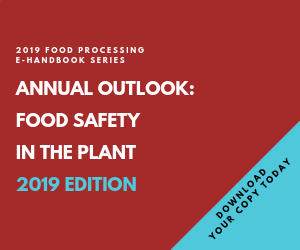 The design, materials and maintenance of plant floors can play a much larger role in food safety than one might suspect. Recently, Stonhard Inc. (www.stonhard.com), which specializes in flooring solutions to industrial and food manufacturing customers, cited last year's cantaloupe listeria outbreak as an example of what can go wrong when flooring is taken for granted. The outbreak that killed 29 persons was eventually traced to fruit originating at a facility at Jensen Farms, near Holly, Colo. Deaths were reported in 12 states in every quadrant of the country, and more than 130 persons fell ill in what is thought to have been the most deadly listeria outbreak on record. A January report from a congressional investigatory committee found that a washing technique using non-chlorinated water may have been the main cause of contamination. But there also were issues with contamination that began on the packaging facility's floor, and a recent press release from Stonhard notes that floors that do not drain properly can harbor listeria that might eventually come in contact with food. "Dangerous pathogens can be found in floors that have not been properly cleaned, equipment not easily sanitized and in places where water pools near the equipment," said a spokesperson for the Maple Shade, N.J., company. "In addition to any obvious debris on a floor, product can become contaminated by the flooring or microorganisms living in debris in tiny crevices in the floor." Floors in areas where product is handled or stored should be constructed of durable, easily cleanable materials and be impervious to moisture. Commonly used materials are concrete, quarry tile, brick and synthetic material. Floors should be installed and maintained to reduce the likelihood of cracks, depressions or other low areas that would accumulate moisture. Floors where operations are conducted should have a slip-resistant surface. Good results are obtained by using brick or concrete floors with abrasive particles embedded in the surface. Concrete floors should have a rough finish. Floors should be sloped to avoid puddles or depressions within the slope where water will stand. Stonhard and other companies offer flooring designed to perform under harsh food plant environments. This can range from acid brick, designed to resist wear and allow for regular thorough cleaning, to poured flooring made of resinous materials including epoxies and polyurethane. Going a step further, some suppliers now carry flooring materials impregnated with antimicrobial compounds, such as silver ions, which attack troublesome mold and bacteria to keep them from proliferating. "In addition to providing fewer crevices for bacteria to fester, Stonhard's Stonplus AM9, an antimicrobial organic compound, can be added to any Stonhard floor as another level of insurance against potential cross contamination of other surfaces and equipment," company officials say. High Performance Systems Inc. (www.highperfsystems.com), Warren N.J., is a flooring contractor offering epoxy and resin flooring solutions including a polyurethane-concrete mix. "Polyurethane concrete flooring has excellent ability to withstand extreme temperatures as well as wide range of chemicals, such as acids, alkalis and solvents," says Jeffrey Smedley, president of High Performance. "It's porous but does not allow bacteria and mild spores to grow in cracks. That's usually a concern with other types of flooring." The General Polymers division of Sherwin-Williams (www.sherwin-williams.com), Cleveland, manufactures a wide array of flooring materials, some of which have applications in food production facilities. These include resinous floor coatings. "The top concerns, particularly for new construction, are durability and cost," says Lonnie Salyers, technical service manager for General Polymers/Sherwin-Williams. "Most companies are balancing durability with what they can afford. The largest companies, with multiple plants, are able to specify or select at a higher level." Salyers says curing times as fast as 24 hours and absence or minimal levels of volatile organic compounds have made polyurethane the preferred material in the past 20 years. He says improvements are ongoing, with materials that can now withstand temperatures of more than 300 degrees F. Resinous floors are typically poured at a thickness of 3/16 to 3/8 of an inch. Among the most recent innovations are coatings made of matching materials. These can be applied in thin coats in low-use areas and also can be used to resurface a poured floor. Of course, floors must also be functional, in the fundamental aspects related to employee safety and comfort. The urethane-concrete blends mentioned incorporate Portland cement and sand (or other aggregate), the latter formulated to provide slip resistance. SlipNOT, a division of the W.S. Molnar Co. (www.slipnot.com), Detroit, specializes in stainless steel safety flooring for a number of industries including food and beverage manufacturers. The company makes stainless steel flooring plates that have been incorporated into floor designs in plants owned by companies including Campbell Soup Co., Frito Lay North America, General Mills and Tyson Foods. "Registered by NSF International, SlipNot flooring products are ideal for food and beverage plants," the company states. "SlipNot stainless steel products are chemical- and corrosion-resistant, providing a sanitary and slip-resistant surface." SlipNot says applications include platforms, cross-overs, stair treads, catwalks, mezzanines, drain covers, ladder rungs/covers, flooring and countless others. The plates are easily cleaned by power washing and a stiff bristle brush. SlipNot even claims its floors have aided in increased productivity in wineries, high speed meat processing facilities, poultry plants and other types of food processing facilities. For many years acid brick has been the standard material for flooring and walls in food plants. Acid brick is extruded from high quality shale and fired at extreme temperatures in a slow moving tunnel oven in a process taking nearly nine days. The finished product is a uniformly dense brick paver made in various thicknesses and surface textures. Acid brick floors provide long-term cost effectiveness and durability, manufacturers say. When coupled with high-performance installation materials and skilled labor, acid brick provides superior thermal shock and chemical resistance. Because of its durability and low absorption rates (well under 5 percent) acid brick is used in a variety of food plants, soap plants and containment areas. This kind of flooring is suitable for extreme temperatures, including freezer environments, and offers average compression strength higher than 23,000 psi.